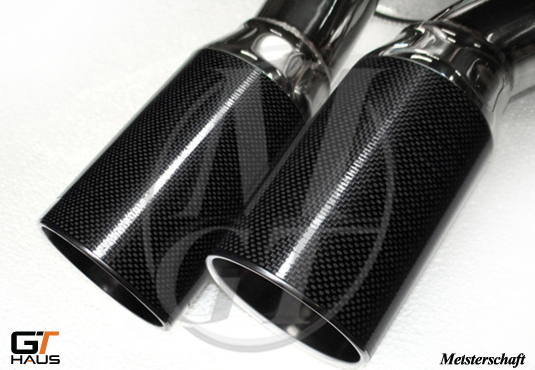 GTHaus Meisterschaft Exhaust System is a must-have upgrade for the restrictive BMW F80/F82 M3 / M4 stock exhaust! As a true race inspired exhaust system, the Meisterschaft Exhaust is very free flowing and features stainless construction designed to take performance to the next level. For the first time in history, BMW has placed a forced-induction motor into an M3, and also now, they have named the 2-door version of the car, the M4. But, with the number of doors and naming put aside, GTHaus set their focus on the sound of the brand new 3.0L twin-turbocharged S55 engine. GTHaus found the OE exhaust from BMW to be quite clever, and interestingly enough, it featured electronic valve control similar to GTHaus' GTC systems they had been producing for the past several years. Clever as it may be, this did not mean GTHaus could not improve on it, which they did. A lot. Achieving the aggressive exhaust sound, as well as the performance that GTHaus was looking for out of the new M3 and M4 was not an easy task. Countless hours, late nights, and many prototypes along the way is what it took to get to GTHaus' three exceptional designs, each engineered to perfection for the true automotive enthusiast. The Meisterschaft GTC, featuring 100% manually operated electronic valve control to provide the most convenience to the user. Aggressive when YOU want it, quiet when you dont. GTHaus' electronically controlled valve system on the Meisterschaft GTC gives you the best of both worlds. With the valves in the closed position, the GTC system produces a sound that is comparable to factory, convenient for your daily commute or any other situation where you find yourself needing to ‘quiet down’ your exhaust. Open the valves and the fun begins. In performance (open) mode, the Meisterschaft GTC brings out the sound and performance of a true M car: aggressive, exotic, perfection. 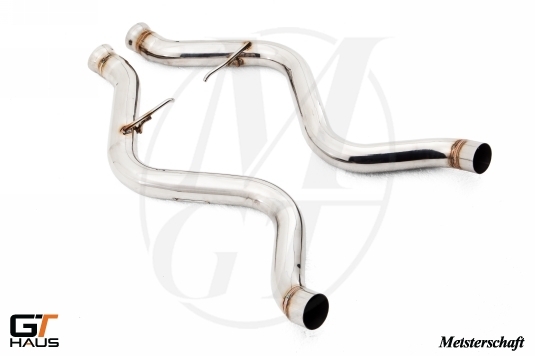 Featuring dual 76mm (3-inch) inlet piping, GTHaus' Meisterschaft GTC optimizes flow in performance/open mode to bring the most out of the twin turbocharged 6-cylinder. This unit is available with either their 4x90mm or 4x102mm Round Split Meisterchaft signature tips. Looking for more? Then there's also GTHaus' optional full cat-back Meisterschaft Dual L.X. Pipes. This set of cat-back piping features dual 65mm cat-back piping into GTHaus' high-flow velocity chamber and back out to dual 76mm piping for a direct connection to GTHaus' SR pipes and rear muffler section resulting in a full bolt-on installation. Additionally, GTHaus' Dual L.X. Pipe section is optimized for horsepower gain. In the near future you can also expect to see a single version of GTHaus' L.X. pipe – featuring enlarged piping diameter and optimization for torque gain. Meisterschaft Premium exhaust systems utilize traditional and modern styling to create the world’s most advanced exhaust system. From the high polish exterior finish to the marvelous hand welds, Meisterschaft exhaust systems look as beautiful as they sound. The sound a Meisterschaft exhaust system produces is truly unique. From a deep bass tone to an exotic high pitched Formula 1 sound, Meisterschaft offers the full spectrum. Every exhaust system is carefully sound tuned to a specific frequency in order to produce the best possible sound. Meisterschaft exhaust systems are significantly lighter than the Original Equipment Manufacturer (OEM) unit’s overall carrying weight. 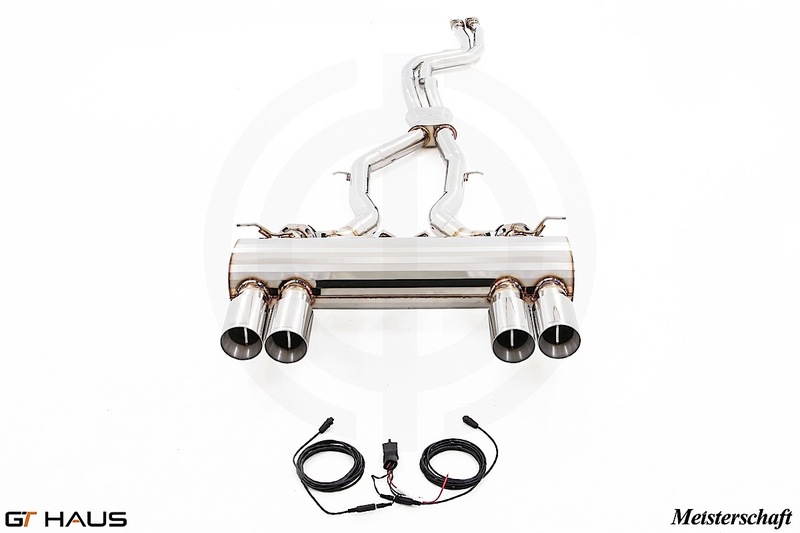 The Titanium (Ti) exhaust system offers a weight reduction of 75% to 80% when compared to the OEM unit. 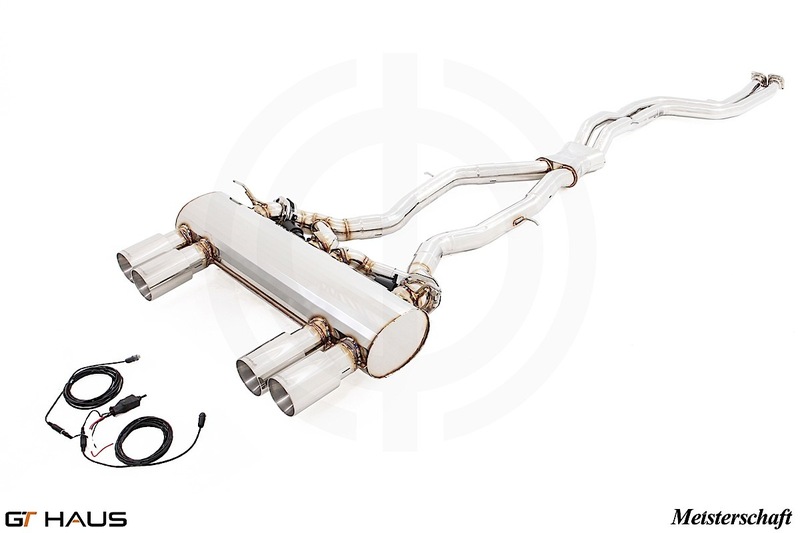 Meisterschaft uses only the highest grade T304/T316 stainless steel sourced from POSCO to create Meisterschaft stainless steel (SUS) exhaust systems. Premium titanium alloy from Nippon Steel and POSCO are used in the construction of Meisterschaft titanium (Ti) exhaust systems. 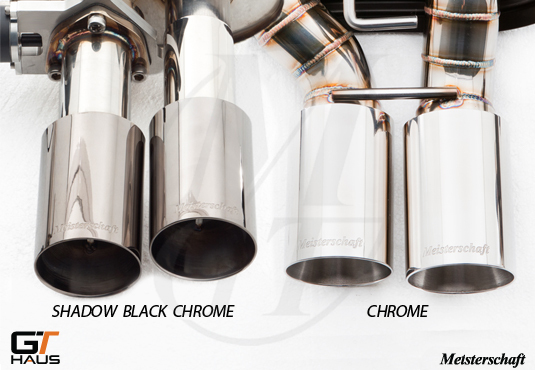 Meisterschaft exhaust systems go through a series of vigorous inspections to assure the highest quality product. Units are pre-tested and quality control checked after every step of the manufacturing process. All final inspections are performed by chief engineers to guarantee perfection. The Super GT Peformance X-Pipe not only increases high-end power output but also serves as a sprung weight reduction, making it perfect for track day use! This simple bolt-in design allows the two parts to be interchanged in a matter of 10-15 minutes. As you may imagine, the Super GT Performance X-Pipe does have an impact on the sound. The effect is an exotic, higher pitch, aggressive and furthermore intoxicating sound! 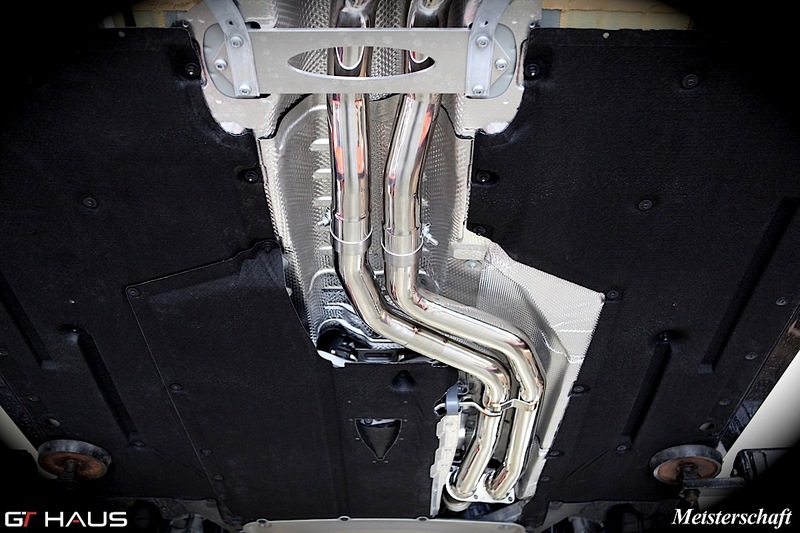 Both GTHaus' GT Racing and GT2 Performance Package come standard with GTHaus' 76mm SR Connecting Pipes. These allow for simple cut and slip-on installation. No welding is required. Bolt-on replacement to the center section of GTHaus' GT Racing rear muffler. This high-flow center section is easily interchangeable and is great for getting the most out of your vehicle for track events and high performance driving! 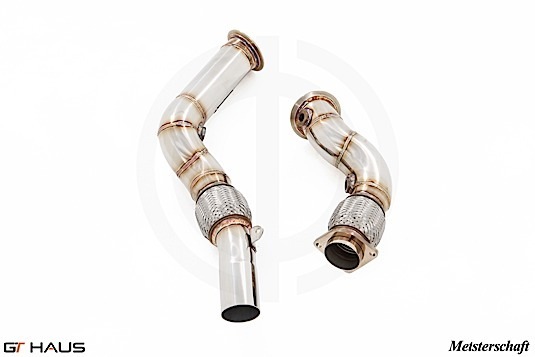 Catless Down Pipes (for Turbo Back) A pair of cat-less downpipes which remove the primary catalytic converters in order to optimize performance and enhance exhaust sound. Full Cat-Back LX Pipes (Dual 65mm Piping) Full cat-back bolt on pipes that provide for a full bolt-on installation. 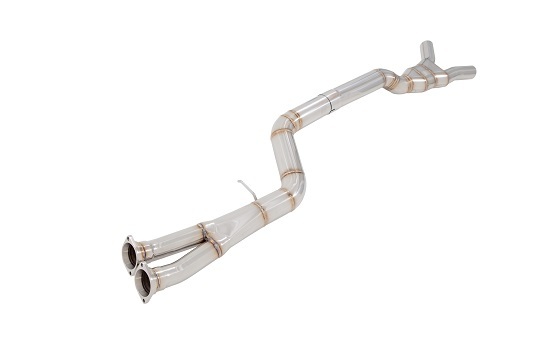 These dual 65mm cat-back pipes are optimized for increased horsepower. Full Cat-Back LX Pipes (Single 90mm Piping) Full cat-back bolt-on pipe that provides for a full bolt-on installation. 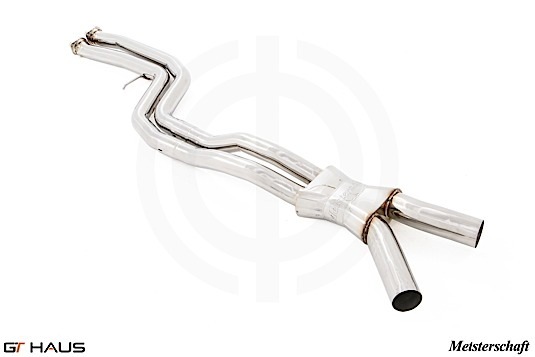 This single 90mm cat-pack pipes combines the dual exit from the downpipe section into one single 90mm pipe that divides at the end for a direct connection to GTHaus' SR pipes and rear muffler. This single LX pipe is optimized for increased torque. Professional installation is recommended. Get this GTHaus Meisterschaft Racing Performance Exhaust for F80 BMW M3 & F82 BMW M4 installed by our experts at ModBargains. Our experts are highly trained to perfect each install.